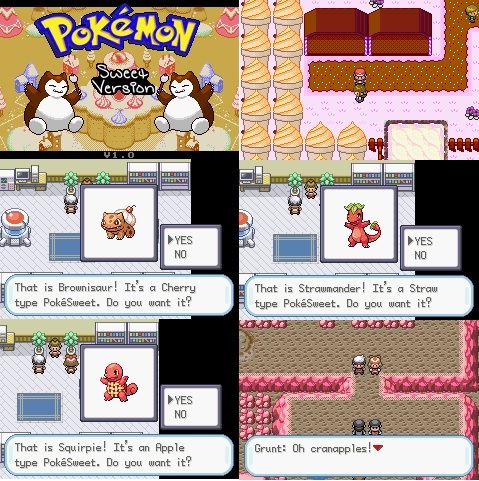 Welcome to Pokémon Sweet Version, where battles are carried out with the power of dessert! Travel through a confectionate wonderland that resembles Kanto but is quite different, as those who explore will soon discover! Capture 151 candified Pokémon and fill up the pages of your Cookbook! 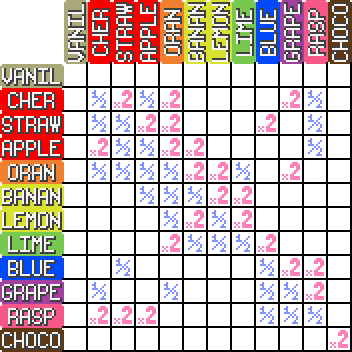 We’ve spared no expense in making the experience unique, which is why there is a brand-new type chart consisting of twelve flavors of ice cream. (Apple is totally a flavor of ice cream.) And if you’re sick of Kanto, you’ll be pleased to know this is totally not Kanto, no matter how much it seems to be. As the world is designed to reward exploration, there’s something waiting in every map that may not have been there before, whether it’s a cleverly hidden item or a dreadfully bad pun. (We have plenty of those.) 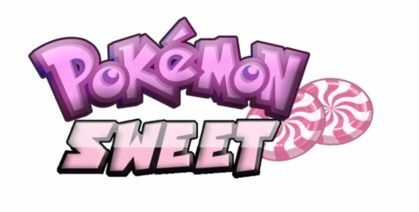 The PokéSweets themselves are as delicious as they look, and they look good enough to eat! – Two rivals…okay, three, but the third guy’s lame. -Apple replaced Steel, so you can’t poison/starve/hunger/inflictdamageovertimedebuff Apples. -Orange replaced Fire, so Orange can’t be burned. -Sandstorm won’t damage Apple, Cherry or Strawberry. -Hail won’t damage Grape, since it replaced Ice.